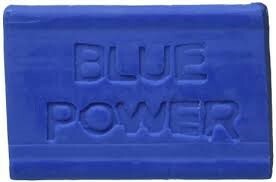 Blue Power fell 95 cents on Friday. The junior market rose 1.23 percent on Friday with advancing and declining stocks equalling each other, with low volume of stocks traded. The market rose 24.08 points to end at 1,984.03 with 15 securities trading of which 4 declined and 5 advanced. The market ended with 900,074 units changing hands, valued at $3,939,648. At the close, 1 security ended with no bid and 5 securities had no stocks being offered for sale. 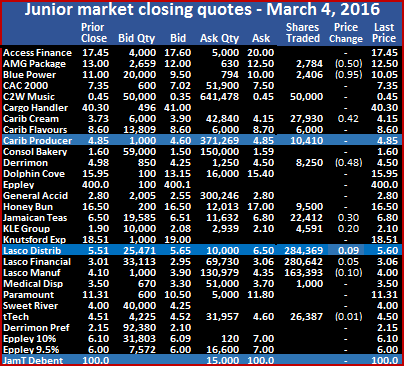 There were 7 stocks closing with bids that were higher than their last selling prices and 3 ended with lower offers. In trading, AMG Packaging closed with 2,784 units changing hands for a loss of 50 cents to close at $12.50, Blue Power ended with 2,406 shares changing hands with a loss of 95 cents at $10.05, C2W Music traded 50,000 units at 45 cents, Caribbean Cream gained 42 cents to close at $4.15 with 27,930 units traded. Carib Flavours had 27,930 units changing hands at $8.60, Caribbean Producers had 10,410 units changing hands to close at $4.85, Derrimon Trading had 8,250 units changing hands to close with a loss of 48 cents at $4.50, Honey Bun traded just 9,500 shares to close at $16.50 but the price reached an intraday high of $17.55 during trading. Jamaican Teas rose 30 cents, ending with 22,412 units changing hands at $6.80, KLE Group rose by 20 cents to $2.10 with 4,591 units changing hands, Lasco Distributors closed with 284,369 units trading, to end 9 cent higher at $5.60. Lasco Financial rose 5 cents to end at $3.06 with 280,642 shares changing hands, Lasco Manufacturing ended trading with 163,393 shares to close at $4 after falling 10 cents, Medical Disposables traded 1,000 units and closed at $3.50 and tTech traded 26,387 shares to close with a loss of 1 cent at $4.50.